The basic concept is simple enough, excite the space with a burst of acoustic energy and record the resulting response. The recorded audio is an acoustic signature of that space which can be applied to any other sound through the process of convolution (literally ‘folding’ the sounds together). There are two ways of performing this process, the first is the method I will explore in this blog post, using a balloon popping or other short loud burst of sound to approximate an impulse. This is the easiest method as the recorded file can be used directly in the convolution plug-in. 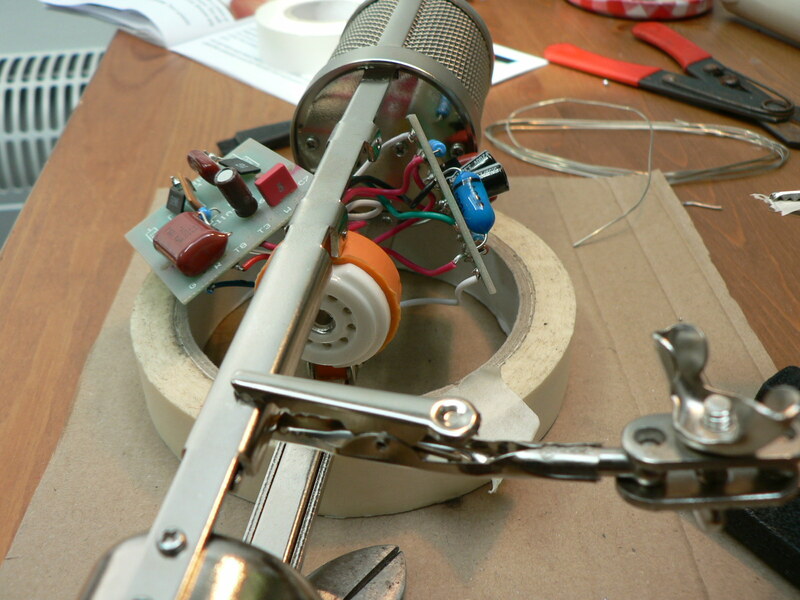 The other method involves recording a sine sweep played back through a speaker into the space. The resultant recording needs to be de-convolved to create the impulse response. Although both methods are widely used, the sine sweep is considered better and there are some very good reasons why, but in practical terms you can still achieve great sounding results using a bursting balloon although it may not offer the most accurate representation of the space. The Tascam is a handy portable recorder that can capture up to 4 simultaneous tracks in uncompressed high quality format, with the added bonus of having 2 built-in small diaphragm condensor mics . You could equally use a computer soundcard and one or two mics. One of the spaces I was going to capture was a small stairway that runs along the back wall of our house. I have previously had some good results using the corridor for re-amping drums , placing a mic there and playing back sampled drums into the space to add ambience. The lower part of the stairway has a sloping ceiling which gives a bit of a flutter echo. The upper stairs has dense, bassy sound to it. I also wanted to try capturing the bathroom downstairs, it’s about 2m x 2m square, completely tiled floor and walls with a textured ceiling, and is quite reverberant. The recorder was mounted on a mini-tripod and sat about 6 inches off the floor for the stairway capture, and on the window ledge for the tiled bathroom. One of the pitfalls I encountered in capturing the impulse response was that the initial pop of the balloon is very loud compared to the resulting echos and can result in clipping in the recorder. It took a few goes to get the levels just right, but once set the actual process was very simple: hit record, hold the balloon up and prick it with a pin. I didn’t experiment a great deal with the effects of location, but I generally had the balloon above the recorder when I burst it. Post-processing was very simple. I trimmed the impulses such that they started just before the initial transient and then faded them out shortly afterwards. I used Audacity but any DAW or editor will do the job. Once edited, just export them as wav or aiff files ready to load into the convolution plugin of your choice. I used the Convolution Reverb Pro device in Ableton Live Suite (it’s a Max for Live device), I like this plug-in as you can just drag and drop the IR file from finder to the device, but it’s pretty simple to do this with Space designer in Logic Pro or Waves IR-1 for examples of other convolution plug-ins. Once loaded into the convolution plugin, simply pass audio through it and hear how it sounds. This one is a bit more present and in your face. This one has a splashy, hard character. Notice how the character of the space is imparted on the loop. By adjusting the wet dry blend you can easily dial in as much or as little of the ambience as you like. It gives it a more non-linear type of sound. I recently watched a brilliant online recording masterclass with Sylvia Massey courtesy of Creative Live, very inspiring and it reminded me of something I’d lost sight of, the spirit of experimentation. During the class she records a band live and demonstrates some of the techniques she uses as well as her creative process. What struck me was how playful it was. Among the many things she did (including vocal feedback delay using 2 mobile phones a mic and a monitor speaker, and passing a guitar signal through a power tool), she re-amped a snare by passing the recorded track back through a speaker with a snare strapped to it. 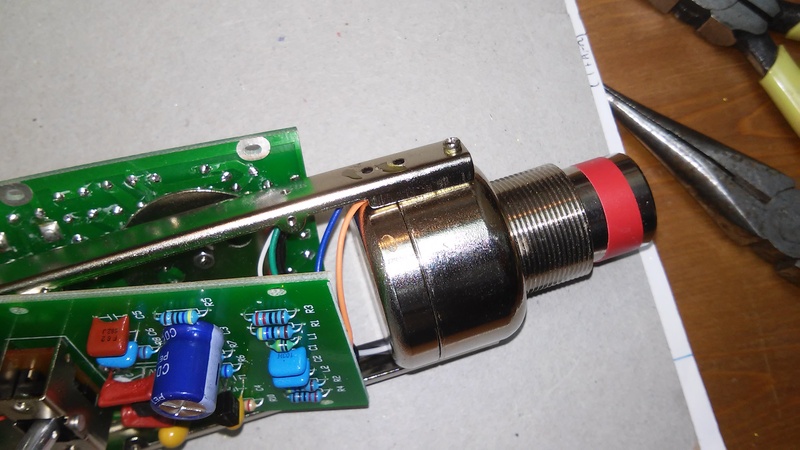 The recorded sound of the re-amp was blended with the original snare to get fatter drum sound. This got me thinking, what else could you apply that too? I’ve been doing a few tracks recently where we’ve used midi piano, I’ve been using the sampled grand piano in Ableton which isn’t bad at all (to my ears at least), however, it’s still a sampled piano and lacks a little dimension. 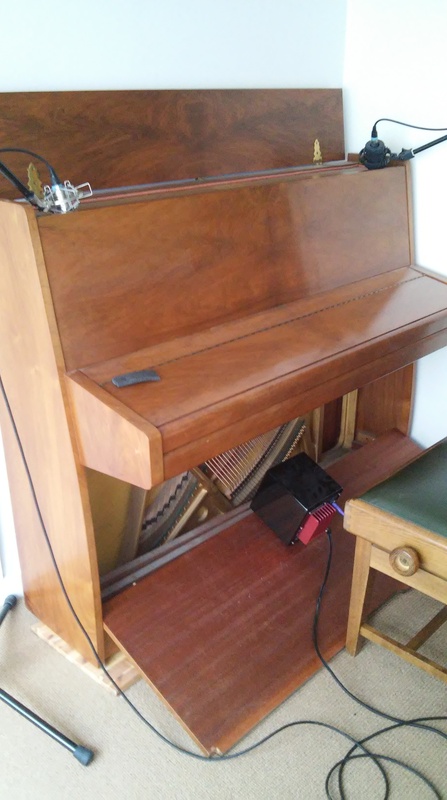 I had the idea of re-amping the piano by passing the sampled piano track back through a speaker playing into the body of the upright piano I have at home, then micing the piano to get a new piano track. The idea being that this new track contains the string and body resonances of the real piano. The final piano track would then be a blend of the 2. Once all this was set up, it’s just a case of pressing play and record. In the mix, just blend the original with the re-amp track according to your taste. You can hear how it adds a depth and dimension to the sampled piano without recourse to loads of plugins. I’ve also tried passing other signals through it, including vocals and guitar tracks,it lends an interesting colour. I’m liking the natural colouration you get with re-amping, it’s something I’m definitely going to explore more. 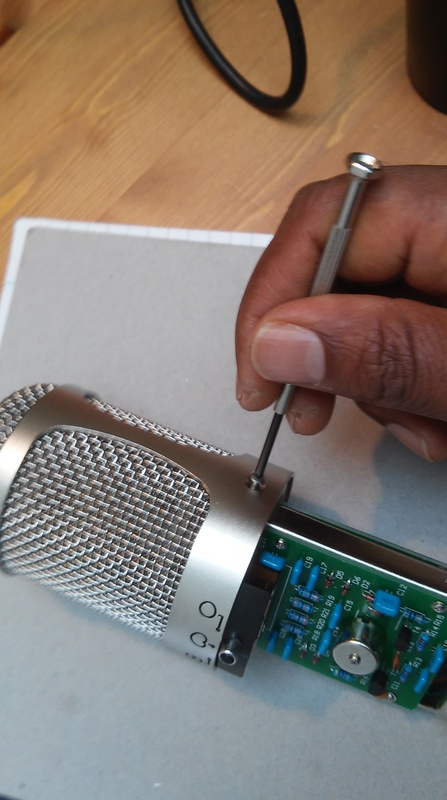 After much standing on the side procrastinating, reading various websites, blogs and how-to guides, I decided to get my hands dirty and take on a microphone modification. I had recently bought an Apex 460 valve mic from the states, and an upgrade kit from the very helpful people at Microphone-parts.com. 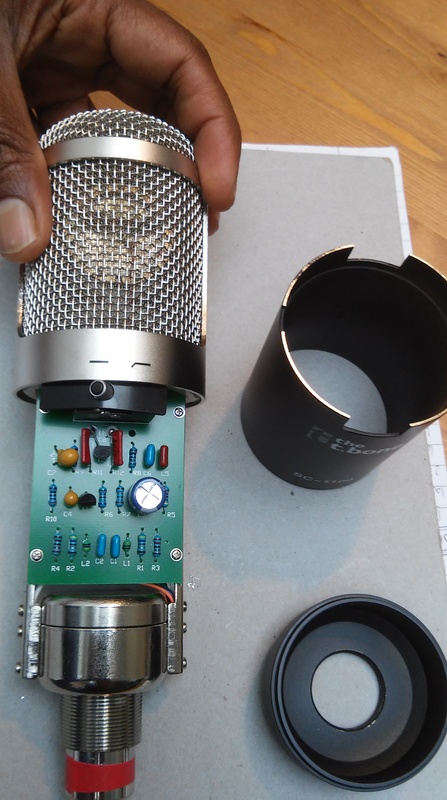 The kit comprises everything you need to convert the stock Apex 460 into a very nice sounding mic. The stock mic sound is nothing special, but it’s only when I did a comparison with the modified version did I realise how big a difference the mod really makes. 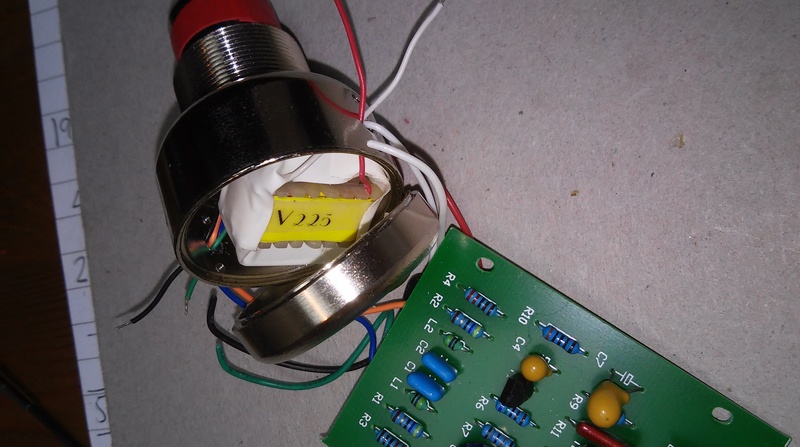 Basically, the modification involves changing the tube to a better quality, lower noise one, removing the RF filter circuit, swapping critical capacitors, diodes and resistors with higher quality components, and changing the capsule for a better quality version. So you can see that it’s actually quite cheap (compared to spending several hundreds of pounds on a valve mic). I’m not a particularly experienced solderer, I know how to do it and have done the odd repair job, but nothing major, and I’ve never desoldered and replaced components on a board before. 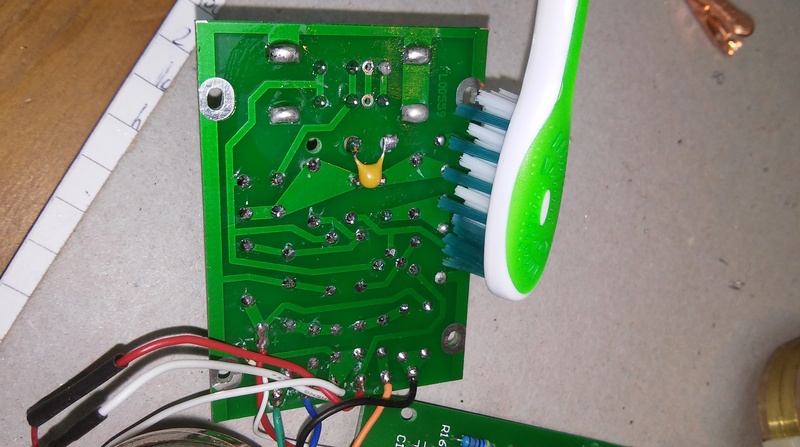 I found the overall process of moderate difficulty, once I got the hang of desoldering it was actually quite quick. 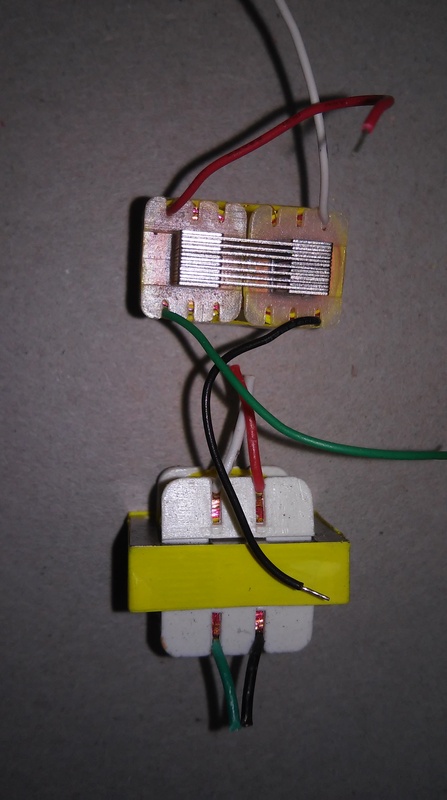 The kit recommends using the vacuum pump to desolder, but I also ended up using the braid in some places because it was easier and cleaner. 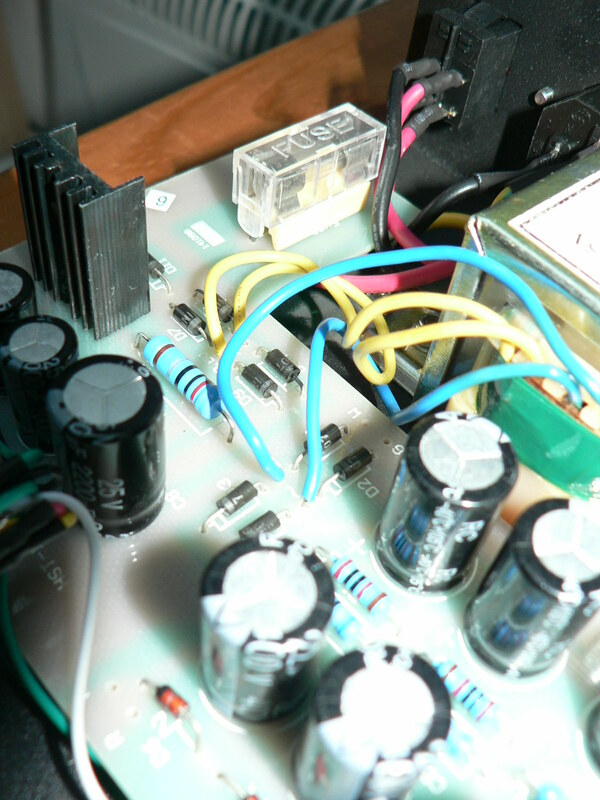 The first task is to swap out a pair of diodes in the power supply, this is fairly straightforward and a good way of easing yourself into the job, you have to make sure the power supply has been disconnected from the mains for at least 1 hour so all the caps have fully discharged and you avoid the risk of electric shock. Once this swap is done, fire up the mic and check all is ok, then it’s time to work on the mic itself. 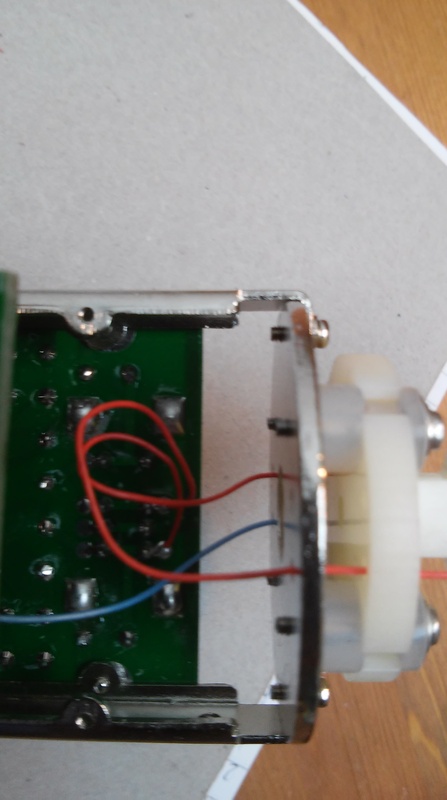 Opening up the mic, firstly you remove the old tube, which is held in place by a spring loaded pad at the bottom, once done you can unscrew the 2 PCBs from the frame, desolder the capsule wires and open up the 2 PCBs to access the joints on the underside. 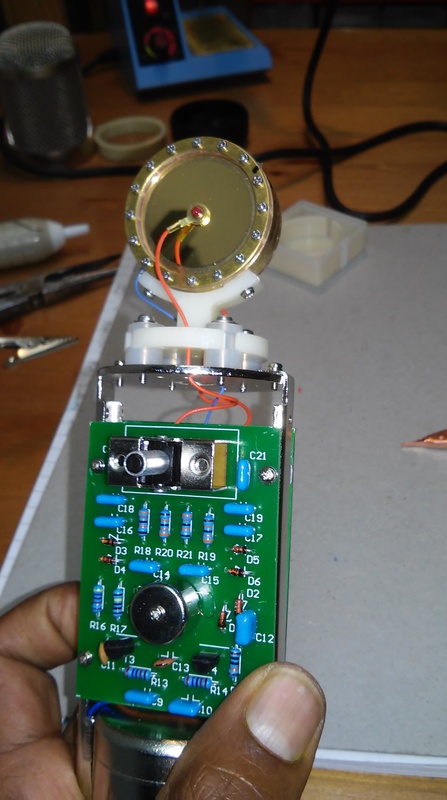 The very detailed and comprehensive instructions tell you exactly which components to desolder. 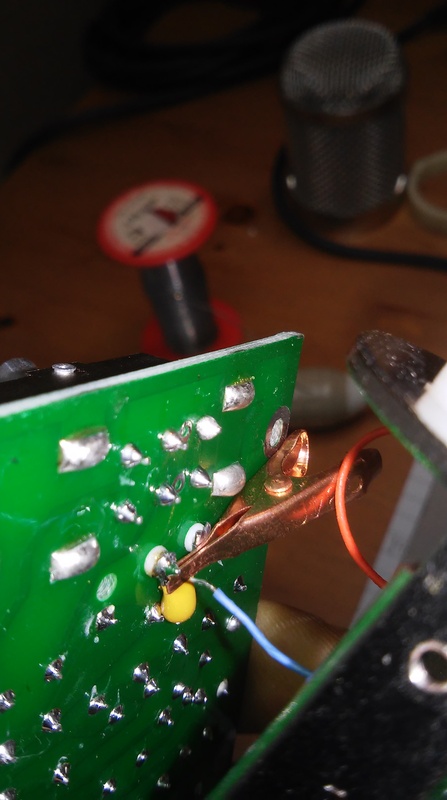 A useful tip here is to always bring the soldering iron in from the edge of the board, to avoid burning any wires or components on it by accident (as I did!). The “helping Hand” tool was also quite useful here, allowing me to hold the PCBs at the best angles to facilitate access to the joints. 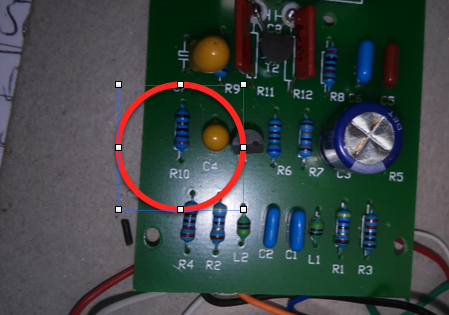 Once the necessary components had been removed, it’s time to repopulate the board with the new components (taking care to observe correct polarity for certain capacitors). 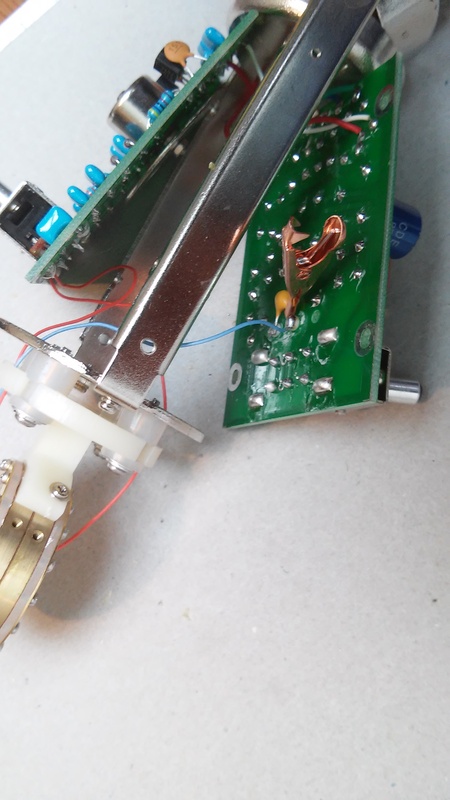 The FOX SG kit comes with a bit of 4% silver solder (audiophile grade apparently), however I bought a meter of the stuff off Ebay, probably my soldering but I ran out of the stuff they provided before the last component was done. Once the components are in, time to clean the boards with the alcohol to remove flux and other contaminants (taking care not to get any on the polystyrene capacitors). 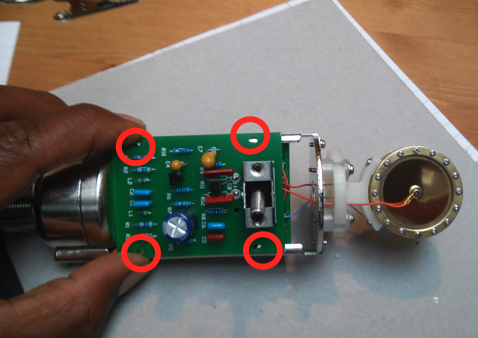 At this stage, they recommend testing the mic, probably wise, so put the new tube in, reconnect the capsule wires and plug in. Providing this goes successfully it is then time to remove the headbasket and swap the capsule. This was the bit I found most fiddly, probably because I was so paranoid of touching or damaging the new diaphragm that I ended up being over cautious. Suffice to say, it was actually quite straightforward in the end, and the new capsule was on in no time at all. 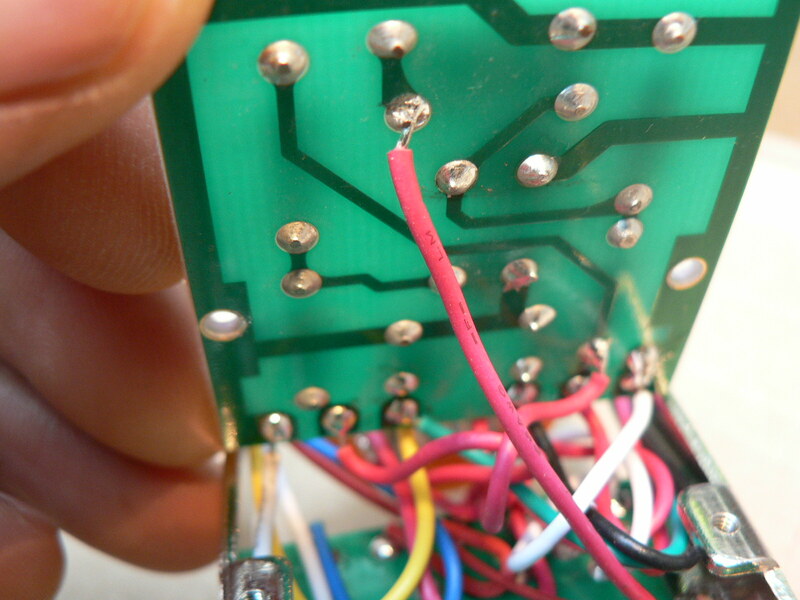 The wires onto the PCB need to be trimmed as short as possible to reduce capacitance, but be careful here, I cut mine a little too short and had real trouble accessing the joints to reattach them.After a final clean and inspection it was time to reassemble and test. 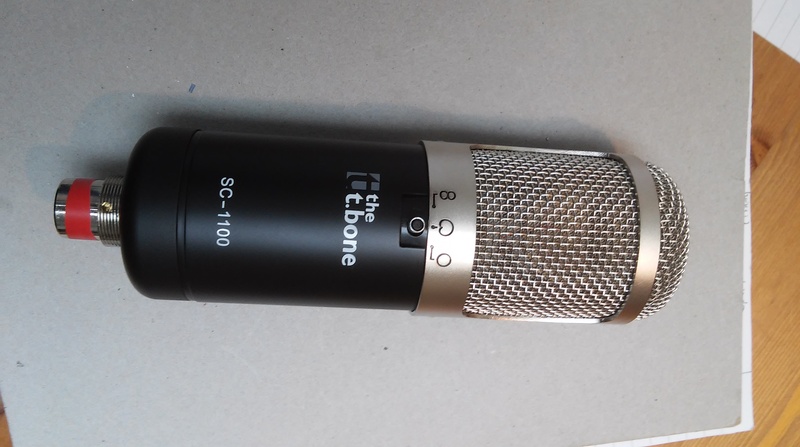 I had been lent a Sontronics Aria for a few days to play with, which was perfect timing as it gave me a high quality reference to compare with. Although the Aria ultimately performs better (slightly quieter and smoother), it is over twice the price and the 460 holds it’s own very well. As a final mod, I decided to remove 2 of the 3 layers in the headbasket, this took a bit of patience and fiddling with a pair of pliers to get them both out, I found using a sharp pointed object to prise up some of the mesh before getting stuck in with the pliers worked best. So there you have it, if you are thinking about doing this and are reasonably handy with a soldering iron then I would thoroughly recommend it, the mic is quite easy to work with and the upgrade kit is great, well documented and the choice of components really makes a massive difference. I’ll be doing this again I think! Here’s the first of 2 videos from this superb Bristol-based Nu soul / R&B outfit. Location recorded and mixed by Wij Productions. This was an intense job, we had a small time window to make use of the venue during the day, 5 hours in all to get in, get setup (audio and video) and capture 2 tunes plus some string section overdubs. Upon arrival, first thing to do was to assess the space and work out the best location for recording. As this was a simultaneous video shoot, the choice of location would have to be some compromise between the best visuals and sound. The venue is a long vault, the acoustics could have been awful but there was enough treatment and choice of position to work with. We opted for the wooden floor in front of the stage, with the band arranged in a semi circle. The video guys set up a track to allow them to slide 1 stand mounted camera back and forth into the middle of the semicircle, with another hand held camera for alternative shots. In this kind of setup, there will always be a compromise between the best setup for acoustics and separation, and the best setup for visuals. The band line up included keys, bass, drums, flugelhorn, 2nd keys, vocal and 3 string players (cello and 2 violins). I used a Universal Audio Apollo Duo and an MOTU 828 mk3 (as an ADAT slave to the Apollo) to capture the full set up, with Universal Audio Solo 610 external preamp to give me another mic channel. The band was mainly electric so I didnt need that many mic channels, just for the flugel horn (with an EV RE20), the drum kit (Audix overheads, RE20 on the kick, Audix D5 on snare, AKG 414 on the high hat) and the voice (Oktavamod Rode NT1a running through the UA 610 preamp). I put a couple of mics on the string trio but we decided to overdub them for the final audio as there was too much spill from the band. Everyone played live through their amps, and a foldback monitor was used for the vocalist. In the end we decided to overdub the vocal as there was a bit too much spill. Part way through the recordings I noticed someone had put the ventilation on, always one of the little things you have to look out for on location recordings in these kinds of places, only becomes apparent when you have a very quiet section (as 1 of the tunes here did). The band we’re a joy to work with, slick, tight and super well rehearsed, they banged out 5 or 6 takes of each tune just like that, which is exactly what you want when time is tight. Once the video guys were happy that they had enough footage to work with, we quickly set up the mics for a more intimate recording of the strings. Acoustically they sounded absolutely gorgeous, the space served the sound very well. I used 4 mics, two Oktavamod NT1a’s as overheads, another facing the cello from behind and to the right, and a TBone ribbon mic in front of the cello. 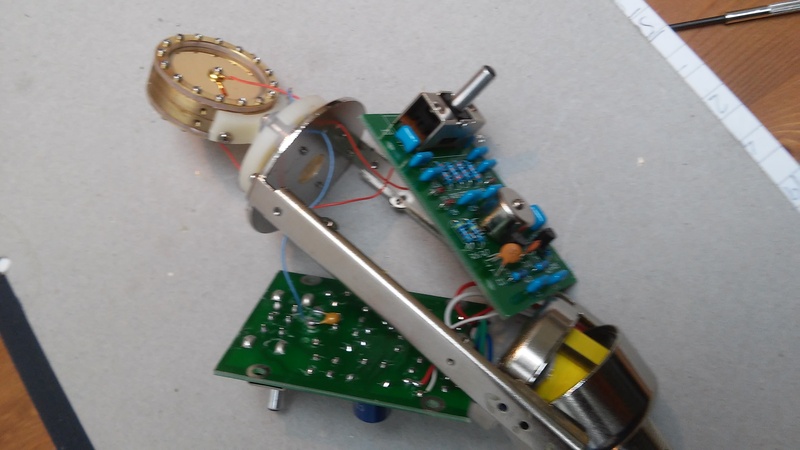 Some may argue that that is a slightly odd setup, but it gave me good results in the mix, I had been reading about how different acoustic instruments project different frequency ranges in different directions and I wanted to explore this. Again, the string trio being seasoned pro’s laid down a few alternative takes of their parts and then we were done and dusted, just half an hour over schedule which was fine as it turns out. The first thing to do when I’m back in the studio is back up the session, you never know! The vocalist came by another day and recorded a couple of perfect takes for each track (I say perfect as they synced up with the original vocal track word for word), then the mix began. I used mainly Universal Audio plugins on this, the concept was to keep it warm and acoustic. Close micing and direct sound from the electric instruments gave me good control over the overall acoustic, I had to do some careful reverb and subtle edit tricks on the overdub vocal as there was some spill from the original vocal on the drum and trumpet mics, it worked out well though. I used a bit of SPL Transient Designer on the drums to help control the ambiance and shape the individual tones. I was really pleased with the way the strings came out to, bussed them through the Fairchild compressor plugin to smooth them out and add some of that fabled valve and transformer warmth. The final mix was mastered by Richie Blake (the bass player in the band) before being sent to the video guy for final integration into the finished product. This recording of the Bristol-based latin band Timbaterra comprises 4 tracks covering Reggaeton, Salsa Romantica and modern salsa styles with influences from Cuban Timba. Recorded in Bristol and featuring vocals of Indira Roman and Sandra Lord, and the piano and vocals of Raimundo “El Nene” Fernandes. Rhythm section features Rory Francis playing all percussion, myself on bass and the horns were played by Ralph Tong (Trumpet) and Dave Smallwood (Trumbone). The aim of this recording was to get the full sound of a 9 piece latin band, but doing it in layers rather than everyone playing together live. The key to this is having a good, grooving rhythm section foundation to build the rest of the tracks on. Thus we first layed down bass, piano and percussion together, the percussion was done timbales first to get all the breaks marked out, then we overlaid the congas, bongos, guiro and cowbell. I borrowed a set of Audix drum mics for the percussion, mic’ing the timbales with a pair of overheads and 1 dynamic under each drum, then individual mics on the snare, kick and bell tree. Vocals were done next, fantastic performances from everyone made this very quick and easy. I used an Electrovoice RE20 for all the lead and layered background vocals, worked very well on these voices. Finally the horns were done, we couldn’t get both players in at the same time so had to go with layering each part individually. This makes things a bit more tricky in the mix when it comes to making it sound like a section, but not impossible. Again, the RE20 microphone did the job of tracing the horns, I used it about a metre away and it seemed to capture the tone nicely. Once recorded, the mixing began in earnest. Although I’d played in latin bands for years, I’d never recorded and mixed latin music, the learning curve was steep! Thankfully Raimundo was there to bounce the mixes off, he patiently listened to a lot of iterations before he finally said, “yes, that’s it!”. In a nutshell, the cowbell needs to be prominent (but obviously not too prominent, unlike here), the congas driving and the rest balanced. Obvious right? Took me a while to get it though. A lot of work went into gelling the horns together to sound like a section rather than individuals playing in separate sessions. I used sample replacement to reinforce the kick and snare drum sounds too, adding more punch than was available in the original recorded sounds. I also go the opportunity to trial a Universal Audio Apollo system, and used the UAD analogue emulation plugins to mix the songs with. Specifically, I used the Studer A800 tape sims on each instrument bus, the EMT 140 plate reverb as a general reverb, the Neve 88RS channel strips for the percussion, Cambridge EQ and LA-2A and 1176LN compressors for vocals and horns. The overall effect was amazing, I got closer to that sound I was searching for than I ever managed with all the other plugins I’d been using. So blown away was I that I decided to invest and bought an Apollo and a bunch of plugs, haven’t regretted that decision! All in all I’m very happy with the way this recording came out, it took a while but I had a lot to learn, I’m looking forward to doing a lot more latin music in the future.